Smooth ice is paradise for those who dance with expertise. 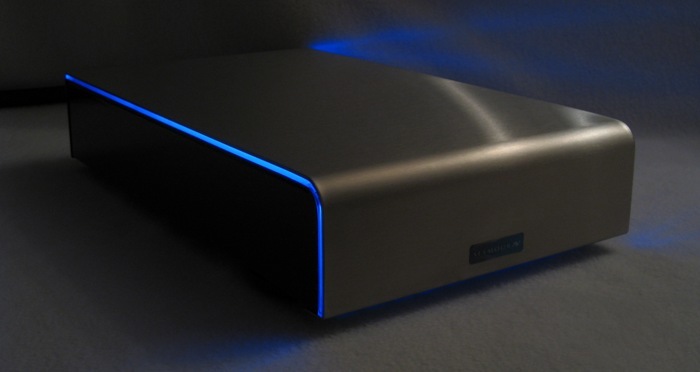 Class A amplifiers average around 20 percent efficiency, meaning 80 percent of their power input is lost to heat.² Class AB amplifiers average around 50 percent. Bang & Olufsen's ICEpower technology gets the efficiency of a Class D, but with a low distortion modulation and improved MOSFET output stage. With this technology you get world class sonic performance with an efficiency of operation that enables you to enjoy the dynamic benefits of much higher output power capabilities. We set out to offer the absolutely slickest, highest-performing application of ICEpower amplification available, but at aggressive pricing. This was the combination that finally killed our reference tube monoblocks that have been heating up our tunes since 1993. The Ice Blocks are smoother, faster, richer, and devastatingly powerful, at 1/4 the price. Traditional solid state amplifiers are limited by the quality of their power supply, having to rectify from a 50-60 Hz source frequency. Even with great cost and weight, residual ripple plagues common solid state amplifiers within the audio frequency range, coloring the critical midrange performance and smearing detail. Ice Block amplifiers use a pulse amplitude (PAM) switching power supply, which operates at 100kHz. The audio output section switches at frequencies between 60 kHz and 500 kHz. These frequencies are high enough to allow for simple inductive filtering far out of the audio band, while still avoiding the noise generation from 1GHz+ power supplies in common Class-D amplifiers. Having the advanced switching power supply operate above the audio band offers the tremendous advantage of allowing the magnetic materials to be used where they are naturally more efficient. While the Ice Block transformers are only a few cubic inches in volume, they perform better than 50-60 Hz transformers that can be nearly 1000 cubic inches and weigh 50 pounds. The copper winding resistance in those beasts limits them to supply less power and their regulation to less than five percent. The regulation in the Ice Block amps is 10 to 50 times better while being hundreds of times smaller. What you get as a result is a remarkable midrange clarity and accuracy. 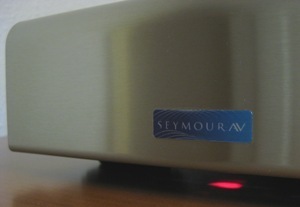 These amps offer the connection into the music that our reference triode amps had, but with lower distortion, coloration, compression and noise. Switchable balanced and unbalanced inputs Even if you're not sure what "XLR" even stands for³, you're kitted up for either configuration. 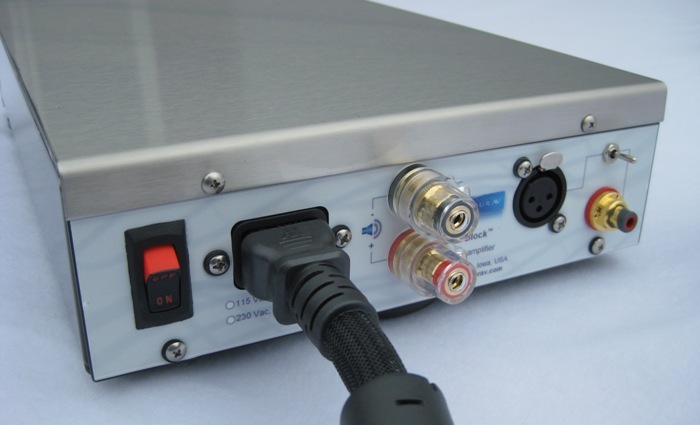 Our design eliminates the need for an input transformer to muddy the sound. D.H. Labs Revelation 99.99% pure solid silver signal wire After experimenting with various wires, we preferred the results from this pricey pure solid silver wire. It improves transients, yet with a more relaxed presentation. WBT Nextgen® Topline RCA terminal The heart of the Nextgen design is the central contact unit built from the plus and minus conductors. The positive pole features a spring loaded double prism contact, while the negative pole utilizes a patented double-wave contact. The conductor material is made of pure copper and plated in nickel free gold to ensure the highest level of conductivity. Select from red, white, black, green, blue, or yellow. 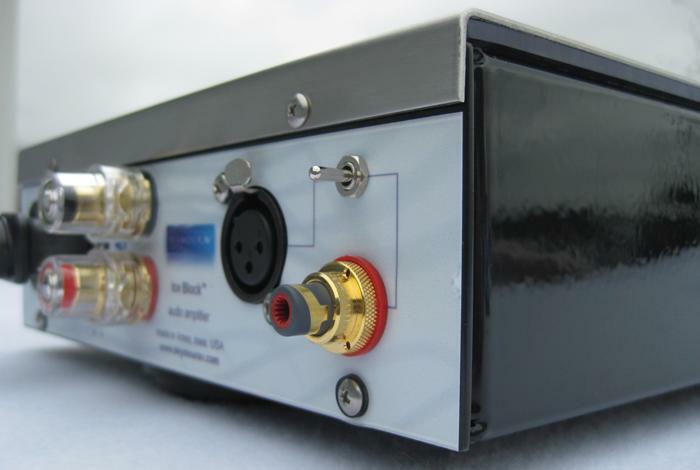 Neutrik® XLR terminal RF protected via a 3-point coaxial ground contact shell and all metal housing. Pin 2 is wired hot per AES convention. Five way binding posts We use insulated binding posts for safety compliance but if you have massive spade lugs on your cables you may need us to install non-insulated posts instead. It's a no-charge option. 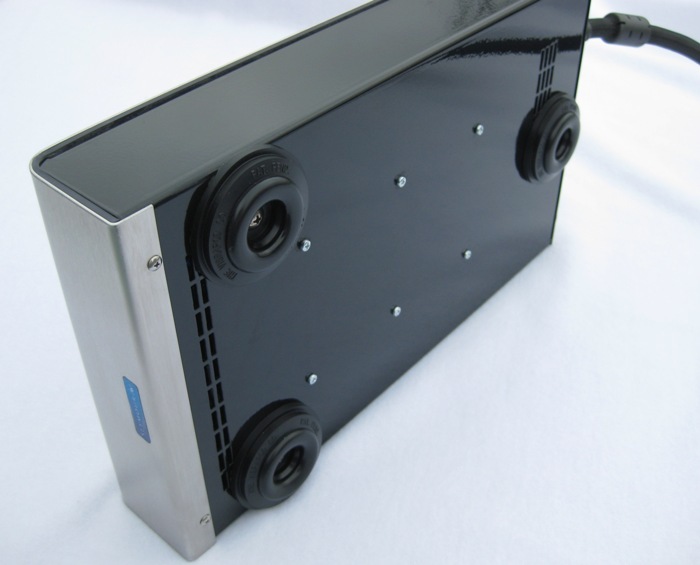 Vibrapod™ isolator feet Horizontal and vertical vibration isolation. 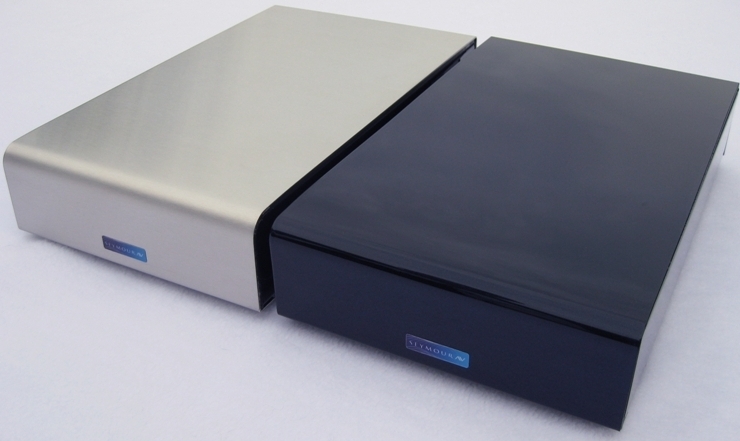 Vibration damped chassis design In addition to using Vibrapod isolator feet, we add an illuminated constrained absorption layer in between the premium finish stainless steel top plate and bottom chassis. The bottom chassis is made from a heavy gauge steel, painted in a classy black gloss finish. Brushed stainless steel, 386 Nanotech finish option We use a new cleaner and nanotechnology finish that creates a barrier to keep the premium brushed-finish stainless steel top plate looking mint, protected from oil and water, and enable the surface to be effectively cleaned with a damp cloth. It's expensive and we were skeptical, but it works. The finish lasts up to 3 years with traditional cleaning techniques, and much longer if you just use a damp cloth. Black pearl blue finish option Our newest top plate finish, a five-coat glossy black automotive clear coat paint with very subtle blue pearl flake. It's glossy, glass-smooth, automotive tough and deeply black with the blue pearl only visible under direct lighting. Credit goes to Jim and Nick for their efforts in creating this beautiful finish. Soft clip circuitry Ice Block amplifiers are equipped with a soft clipping circuit that applies light compression at maximum output, limiting the maximum signal level. This eliminates the clipping that traditional amplifiers experience when their signal exceeds the capabilities of the output devices. This feature ensures that you have optimum sound in high-level situations and protect both the amplifier and your speakers from dangerous tweeter-frying distortion. Unlike most other ICEpower applications, Ice Blocks feature a separate indicator light to let you know when the amp is shaping the input signal. You not only benefit from knowing the soft clip circuit is protecting your system, but will also learn under which conditions the amp is compressing your signal and whether or not you've properly sized your amplification power to your system and listening habits. RF/ EMI hardened assembly ICEpower technology uses pulse amplitude modulation (PAM) with a patented Multi-Variable Enhanced Cascade Control chip instead of the 1GHz+ sawtooth signal that common pulse width modulated (PWM) Class-D designs use. This dramatically reduces the switching frequencies used and resulting EMI and low pass filter distortion. Still, from our previous experience in sensor designs for RF environments, we've learned some tricks to maximize RF rejection. How the wiring is routed and twisted, star grounding and a line filter eliminate potential artifacts. We not only strive to maintain B&O's superbly low-noise technology inside the box, but to also keep out the junk that plagues our connected world. 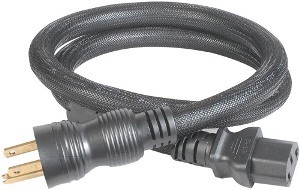 AR Pro II Ferrite Noise Trap (FNT) IEC power cord (115v version only) Large, 12 AWG, 99.997% pure copper conductors are silver-soldered to 24k gold plated contacts within the hermetically sealed connectors. 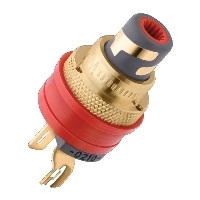 This reduces cable resistance, as well as oxidation, and increases load capacity. FNT (Ferrite Noise Trap) technology provides superior isolation from RFI (Radio Frequency Interference) and EMI (Electro Magnetic Interference) for noise-free performance. Two 95% copper braids and one 100% aluminized Mylar creates a dense multi-shield design to further protect against RFI and EMI. The complete length of the cable is protected with a braided nylon jacket that helps to eliminate snagging. A 3 foot cable is included in the unit price. Longer 6, 12, or 20 foot lengths are substitutable at an additional cost. They are not very flexible, so we recommend you order a bit longer length than you may have otherwise planned on. Note: We only have the 3ft and 20ft in stock, available only while supplies last. This is a discontinued component. 115v and 230v versions available The 230v versions don't come with a power cord. 100 hour burn in All of our amps are burned in for 100 hours to not only make sure that every module can stand up to our warranty, but also that from the moment you turn on them on you are that much closer to hearing what they can really do. 10 year warranty Ice Block amplifiers feature comprehensive protection on their true balanced outputs from thermal, over current (shorting/grounding), high frequency, capacitive loading, DC, and soft clipping circuitry. Through better design we are able to offer one of the best amp warranties in the business. ¹Currently, 11 to 13 percent of the average American household's electricity bill stems from consumer electronics. But that is projected to rise to 18 percent by 2015, according to the EPA, part of the Department of Energy. ²An additional one to four times that heat energy would be needed to remove the heat during air conditioning. ³"X" for Cannon's (now ITT-Cannon) "X" series design, "L" for when they added the latch, and "R" for when they added to the female end a rubber encapsulation around the contacts.